What we now know as Anthony Chabot Elementary School was founded at the current location as the Claremont Annex School on January 7, 1927. Before that time, Claremont Junior High School (now Claremont Middle School) had included kindergarten through junior high school. The PTA, with 86 original members, played a major role in the creation of the new school. The first PTA Treasurer’s Report, dated February 3, 1927, showed a balance of $54.50. 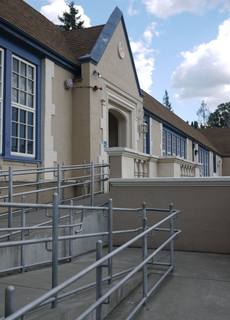 On August 27, 1927, the school was dedicated and renamed Chabot School in honor of Anthony Chabot, a 19th-century entrepreneur who built Oakland’s first municipal water supply by damming Temescal Creek. There were 415 students enrolled. The Chabot district at the time was apparently a little larger than it is today; records of PTA members include addresses that are now in South Berkeley or slightly west of the current Chabot district border. By 1928, the PTA included 285 members. The PTA discussed the advantages of “teaching rhythm in a musical way to 1st – 2nd – & 3rd grades.” The PTA also discussed a gardening program. School field trips that year included a visit to the Immigration Station on Angel Island – the point of entry for most Chinese immigrants to California – and the Sixth Grade studied immigration issues. In 1930, the Superintendent’s Council recommended that the name of the school be changed to Anthony Chabot School. A letter dated August 20, 1930 from the Superintendent of Schools to Principal F.B. Zimmerman announces that the Board of Education approved this change. Enrollment grew, and in 1931 reached 443 students. In 1932 the PTA implemented child study classes and swimming classes (the PTA records do not say where the children swam). By the late 1930s, the PTA meetings had themes connected with world events. The Report for the Year 1937-1938 reports “our program this year was especially significant – peace through understanding.” PTA meetings, held in the Auditorium, seem to have been quite the social events, with tea served in a “gracious manner.” The meetings also seem to have had educational components, with guest speakers on such subjects as local natural resources, child development, crime prevention and law enforcement. They even featured occasional performances by the students. At one meeting a local Boy Scout troop acted as Guard of Honor. The first woman principal of the school, Miss Leslie Smith, was introduced in the 1941-42 school year. The same year saw a successful Bazaar Carnival, which netted $322.25, and “Plans for a Spring Luncheon and Fashion Show were announced, with the proceeds to go to the Red Cross.” Movies seem to have been important at Chabot, since the PTA boasted a Motion Picture Chairman. The 1942-43 theme was “Firm Foundations for Children in Wartime,” and PTA minutes reflect many discussions of the war, particularly its effect on children. The Financial Secretary reported that $449.28 was taken in during the school year.